Free Download of Tools and Supplies - What Do We Need To Build a House? (Excerpt from "Quick Haitian Creole Grammar Reference"
You can also find vocabulary about home building in this textbook in Creole/Spanish, "Que Tal? S-ak Pase? N-ap Boule! Bien!" 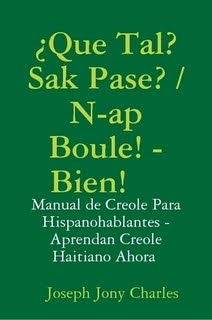 Manual de Kreyol Para Hispanohablantes - Aprendan Creyole Haitiano Ahora! Compren su copia del libro electronico hoy. Bajen su libro electronico!